The HVAC Psychrometric Plus application allows you to easily perform single-state and mixed-air HVAC psychrometric calculations using your iPhone and iPad. 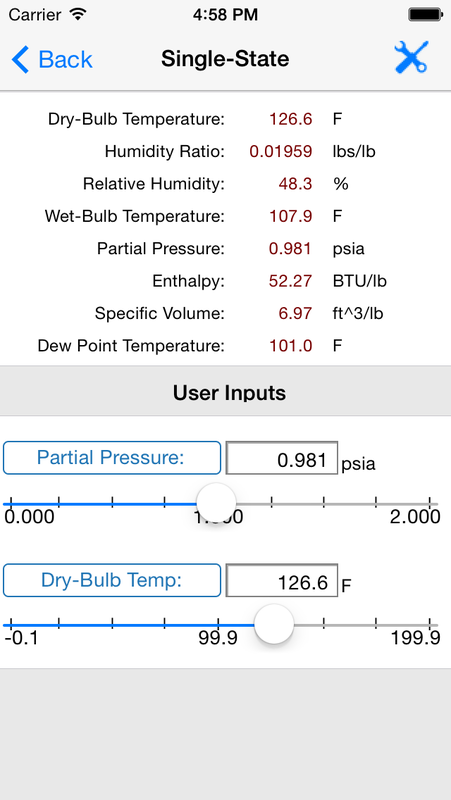 The HVAC Psychrometric Plus app is a universal app that works on both your iPhone and iPad and adjusts its screen size accordingly. Select from two separate input modes. The "Single-State" mode allows you to specify 2 psychrometric parameters for a single stream of air and view the remaining 6 calculated values. You can quickly toggle through 20 different combinations of the 2 input parameters and instantly view the calculated results, all on the same screen. The 2nd input mode is the "Mixed-Air" mode that allows you to specify 2 psychrometric parameters for each of two air streams to calculate the mixed air psychrometric conditions. Once again, you can toggle through 20 combinations of the 2 input parameters and view all results in one screen. You can specify additional parameters such as the altitude of the air being analyzed, the atmospheric pressure, different types of units such as degrees F or R, and English or Metric units. Immediately view updated results as you change the input values using the on-screen slider control. Email all inputs and results from both the single-state and mixed-air modes along with a spreadsheet attachment. Click the image below to view more app screenshots.